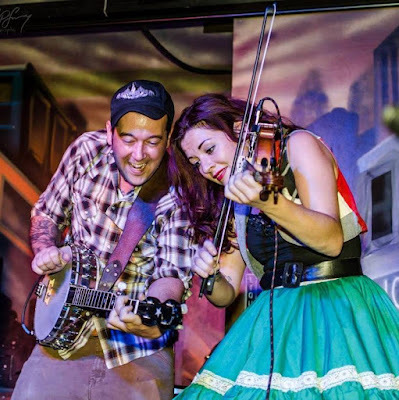 Mix one part Texas fiddle and one part Tennessee banjo, add doghouse bass and a splash of guitar and you have one heck of a powerful punch called The Urban Pioneers. This string band hammers out a variety of original songs that encompass old time hillbilly music, western swing, rockabilly, and even a few gypsy type songs for good measure. They spend about 75% of the year on tour all over the world delivering their brand of high energy hillbilly folk music. Until recently, Liz Sloan and Jared McGovern have been household names in the underground roots community because they were outstanding backing musicians, but it didn’t take long for the Urban Pioneers to prove themselves to music lovers of all kinds. Liz and Jared toured and recorded with countless bands in the past but when their last band broke up they decided to give it a go on their own. The Urban Pioneers started out as a means of transportation to pick up a bass that Jared had built down in Florida. The bass was a thousand miles away and the only way the couple knew how to travel is by touring. Jared had recently been trying to learn clawhammer banjo so they wrote some silly songs, recorded them, and joined the Coney Island Road Show that was headed south. They needed to think of a name and a few weeks before a police officer called the urban pioneers because they were “punk kids living in the roughest neighborhood in Pittsburgh”. The duo was soon joined by Keith Urban from Louisville, KY on the upright bass as well as a handful of guitarists to fill out the sound. With their second album release there is no sign of stopping anytime soon. Be on the lookout for their Vehicle In Transit because the Urban Pioneers are Addicted to the Road. Tickets: we only have 60 tickets on sale for this show!